Nowadays, people expect their product searches to return filterable options, so allowing them to sort by size/color/style is no longer enough. Understand that, Mageplaza is happy to announce that Layered Navigation extension for Magento 2 now includes a wonderful feature, named Product State Filter. This feature takes responsibility of allowing the shoppers to filter the items by New, Sale and Stock status. No wonder it will be an advantage for your layered navigation and make your store stand out among the competitors. Filter the New items based on the Set Product as New From configuration. Filter the Sale items followed the Special Price configuration. Hide the Out of stock items. Why you need Product State Filter? At first, let’s take a look at some common cases. Case 1: Mary is passionate in fashion and always wants to follow the newest trends. She usually browses many online shops and updates the new items to pick up one she loves no matter how much. However, there is no shop allows her to filter those new items and she needs to scroll down and down just to find a dress or a bag. Case 2: An online store is running a big sale campaign for a bunch of their products. John is really excited to find his desired item but the shop only have a big collection contains all the sale products and he must open each page to find hopelessly. Case 3: Emma’s in an urgent case and she needs to buy an item as soon as possible. Unfortunately, after choosing multi-filters on the Layered Navigation, almost the result products are out-of-stock. How can she find the in-stock one and make a purchase? Not only those 3 cases above, millions of shoppers now structure to find their desired items because of the lack of Product State Filter features. However, with Mageplaza Layered Navigation extension for Magento 2, it will no longer a hard task. This wonderful feature is one of the most effective ways that brings to your shoppers a pleasant experience, save their time and increase the conversion rate. Give them what they need in a second, they will more likely to make a purchase. As a result, your business will be boost significantly. Go to Mageplaza > Layered Navigation > Configuration > Filter Configuration > Product State Filter. In this section, you can edit the Product State label or enable/disable the Expand by default option by choosing Yes/ No on the field. 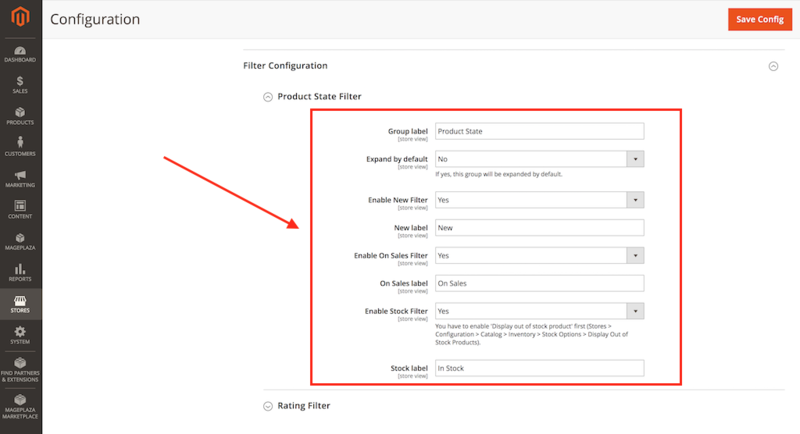 Importantly, there are more 3 fields for you to config: Enable New filter, Enable On Sales filter and Enable Stock filter. Turn the field as Yes to activate or leave as No to disable the filter. When you choose Yes, another field will appear allows you to edit the label text. Click Save Config and check the result.